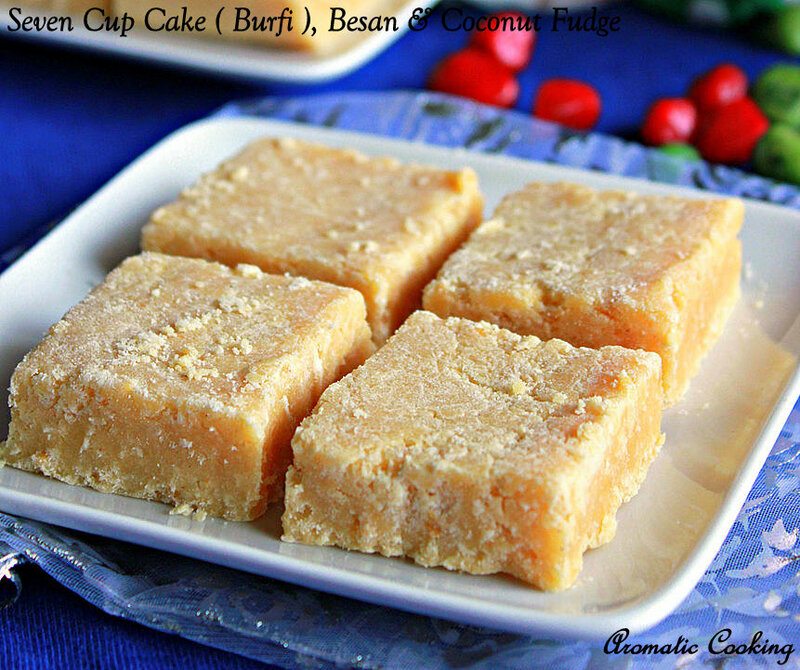 Seven Cup Cake ( Burfi ), is an easy sweet but somehow I have never tried to do it till now. 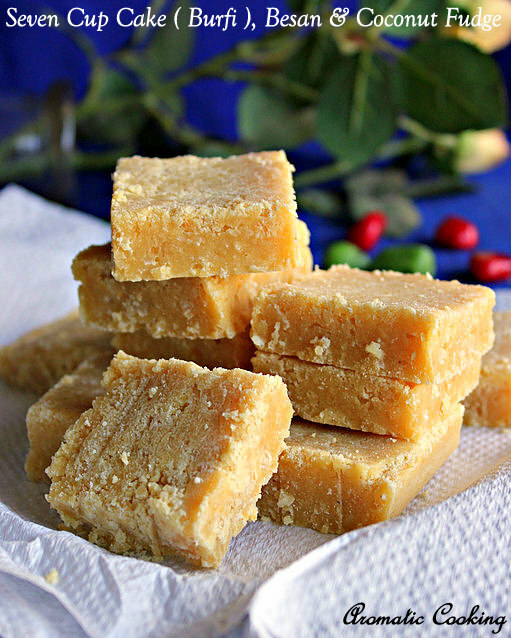 It's basically a combination of the mysore pak ( besan fudge ) and the coconut burfi. The name seven cup denotes the total cups of all the ingredients used, 1 cup besan flour, 1 cup coconut, 1 cup milk, 3 cups sugar and 1 cup ghee. I found the sugar was a little too much, so I made small changes in the quantity. The burfi came out really good and it tasted very delicious.. Grease a tray with ghee and keep. Heat a teaspoon of ghee and roast the besan flour for about 3 to 5 minutes, till you get a nice smell, but make sure the color doesn't change. Switch off the stove, add the coconut, milk, sugar and half the ghee. Mix it really well and make sure there are no lumps. Now put it back on the stove, keep stirring on medium heat. The mixture would become thicker, add the remaining ghee and keep mixing. At one point, you'll see that the mixture has thickened so much and it's becoming a little difficult to turn the mixture. You'll also see the edges drying up, and the sugar forming white pieces. Immediately pour it in the greased tray, tap the tray or spread it out with a greased spatula. After spreading it out, using a butter paper or parchment paper, smooth out the top and let it cool for 10 minutes. When it's still warm, cut it out into square pieces, but don't remove them yet. Let it cool completely, then remove it carefully and store it. Roast the gram flour well, otherwise the sweet will have the raw besan smell. 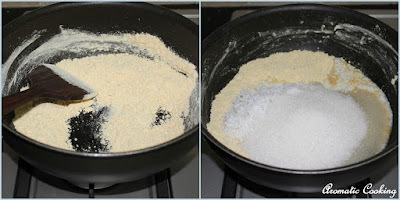 The ingredients came to only 6 3/4 cups, I reduced the sugar by 3/4 cups and increased the besan by 1/2 cup, if you want, you can increase the coconut by another 1/4 cup, that way you'll end up with total 7 cups. The final consistency is very important, if you let it cook further, then you'll not be able to spread and might end up with very hard burfis. Look out for the sugar forming the white stuff, and when it starts drying out in the edges as we keep mixing. The above quantity will give ou about 30 to 40 burfis, depending on the size of the tray.